Garnier Eye Cream: Does It Work? Here are my thoughts on Garnier Eye Cream…….. 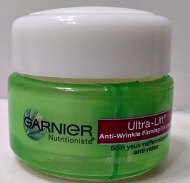 In my constant search for a good drug store brand eye cream with anti-aging ingredients - I decided to try the Garnier Ultra-Lift Anti-Wrinkle Firming with caffeine. The product description says it’s supposed to lift, firm and help reduce wrinkles, fine lines, and crow’s feet. The label says that, after two weeks, you should see firmer healthier looking skin around the eyes. It also contains a popular anti-aging ingredient called Pro-Retinol to help reduce wrinkles and crepey skin. Pro-Retinol is a natural form of retinol (retinyl linoleate). According to the company this form is gentler and is not supposed to irritate sensitive skin like other forms of retinol. I don’t believe that any eye cream will completely remove wrinkles or perform miracles. But I was searching for a good, inexpensive hydrating eye cream that contain what I call “anti-agers” (you know anti-aging ingredients that are good for the skin and may help prevent and slow down the signs of aging). These “anti-agers” include ingredients like: alpha hydroxyl acids (AHA), copper peptides, retinol, vitamin C........……Click here to review a list of active cosmetic ingredients. Well, after two weeks, I can still see the deeper lines and wrinkles. But, the skin around the eye area does feel more hydrated and softer. There is no question – the skin looks and feels healthier. And that moist hydrating feeling stays for hours without having to reapply the cream. Did the Garnier eye cream firm and lift the skin like stated on the label? I can’t really tell. I’m not saying it didn’t fulfill its promise; I just don’t see much of a difference there. All in all, I like the Garnier Ultra Lift Anti-Wrinkle Firming Cream. I like the way my skin looks and feels. It does help soften those really tiny lines - probably due to the extra hydration. Plus, it’s not expensive. Does it really do what the product description claims…..reduce wrinkles, lift and firm? I don’t know – it’s hard for me to see a big difference there. For a basic, inexpensive eye cream/moisturizer - this product does a nice job. However, for further support to help reduce the appearance of fine lines, crepiness or especially puffiness - I still rely on the Eye Tuck Serum to help firm and smooth the under eye area. I apply the Eye Tuck Serum on top of the Garnier Eye Cream after it has had a chance to soak into the skin. Do you have a favorite eye cream? Have you tried the Garnier Eye Cream Ultra-Lift or the Garnier Eye Roller?